Jake let out a huge sigh and sat up. He’d just spent the last half hour laughing. In front of him stood a very miffed donkey’s backside. It just stood there, not saying anything. Of course, it wouldn’t say anything because every time it did say something Jake would fall into another fit of laughter. How often have you heard a voice emanate from underneath a donkey’s tail? Jake closed his mouth very tightly, trying to keep it as straight as possible but one side of it always kept jumping up, twitching. “Mm-mmm-mm he he he mm-mm ha! Pfffrrrrrrrpppp-hmmm,” went the closed mouth. Orph, in his guise as the back-end of a donkey, was even more annoyed by the flies buzzing around his tail. Every-so-often, the tail would swish to get rid of the flies, along with a voice saying “Get out of my face!” And this was made worse by Jake laughing more. Jake cleared his throat and sighed, “Yes. Yes, I have finished now.” Orph wasn’t sure but he thought he spotted a titter briefly flitter through Jake’s teeth. The tail appeared to look around. “It’s not here, it’s here?? ?” Jake was so confused he really did forget that Orph was talking out of his… posterior. 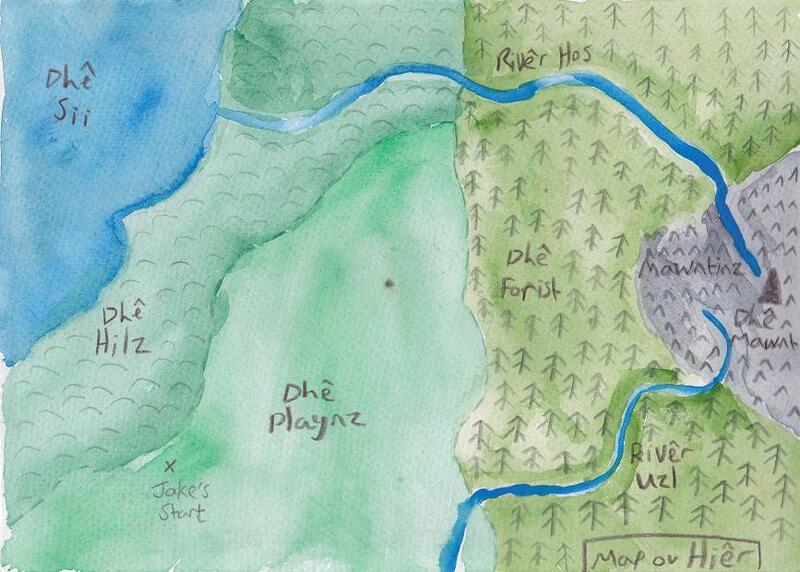 Jake looked around at Hiêr, seeing nothing but a big plain to the south and east. To the north-west of him were some hills. Just then Jake noticed something in the direction of the hills. It looked like a person, with a small, thin body and big, square head. As Jake and Orph got closer they saw it was a sign with some words and an arrow pointing north-west. What did they have to lose? 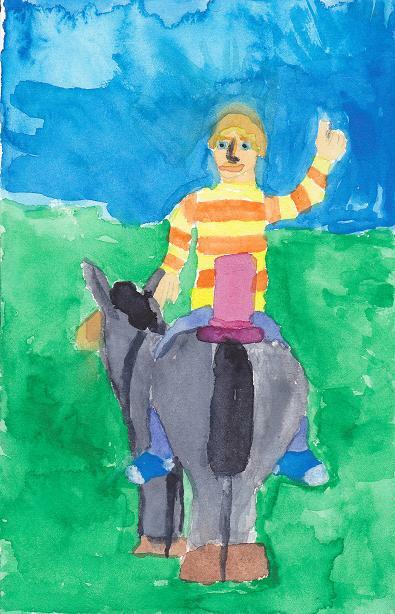 So off they went, the gallant rider on his backwards donkey, off towards the distant horizon. Funny! I love your playfulness. Great, Adam! I love your playfulness. I am commenting two ways. Good idea to connect to facebook for this journey too. I am grateful to be a part of this journey. Brilliant, as always 🙂 Do so enjoy your posts.